The Shell Rotella Cup returned in 2017 with four marquee events spread throughout the NTPA regular season. Eligible NTPA Grand National competitors scored points at the marquee events in five divisions: Unlimited Modifieds, Super Stock Diesel Tractors, Two-Wheel Drive Trucks, Four-Wheel Drive Trucks, and Modified Minis. 4/5 of the divisions pulled at all four events with the Two-Wheel Drive Trucks competing at Benson, Tomah, and Bowling Green. The Rotella Cup started as an extension of NTPA support from individual teams, to a year-long sub-competition for the entire series to enjoy. This organic growth of exposure has resulted in more pullers using Rotella product in the equipment on and off track. Rotella and presenting sponsor of the Rotella Cup, O'Reilly Auto Parts, further activate these four events with customer hospitality areas and individual round incentives for pullers. Both Walmart and O'Reilly Auto Parts featured the Koester Racing Team with appearances at local retail locations. 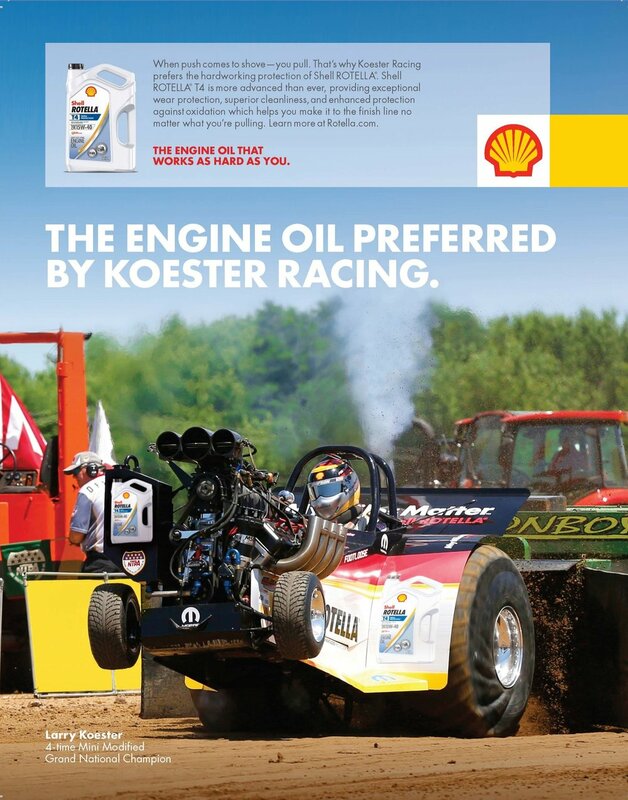 Shell Rotella ads featuring Larry Koester and Craig Corzine ran in both of the NTPA's "The Puller Magazine" and the "PULL! Program" throughout the 2017 NTPA Grand National season. Shell Rotella will also have a full page ad congratulating the 2017 Shell Rotella Cup winners in the October 2017 issue of the "The Puller Magazine." Each Rotella Cup event brings a certain prestige to the competition that you can experience by scrolling through this recap. O'Reilly Auto Parts activates their presenting sponsorship with customer hospitality at each Rotella Cup Event. In Benson, 20 customers from Dilmar Oil were invited to experience the tractor pulls, where they could enjoy fresh BBQ and time to chat with the Koesters and Corzines between pulls. Guests enjoyed private hospitality areas throughout the weekend. 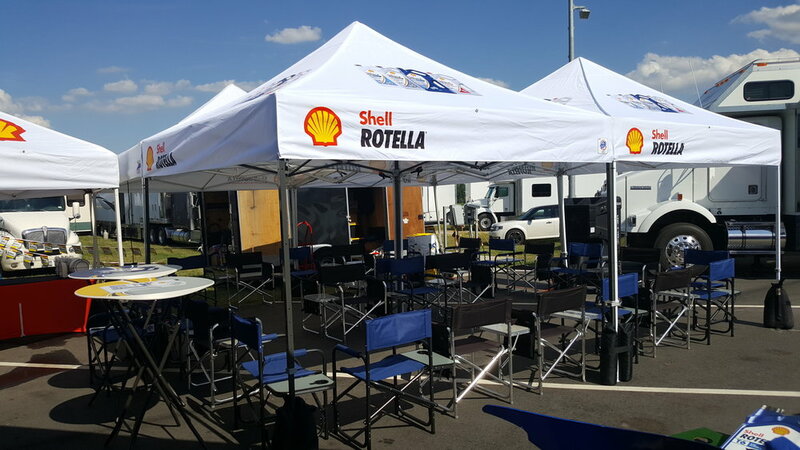 A Rotella fan-engagement zone is setup near the track throughout the weekend. Surrounding the main event, Koester Racing made appearances with their tractors at a local O'Reilly Auto Parts and Walmart store. A little rain never hurt anyone! Crowds are a sure thing when Larry Koester is out working on his tractor. Presenting sponsor of the Rotella Cup, O'Reilly Auto Parts, used round 2 in Tomah as an opportunity to bring together over 70 customers from the area. Guests from Woodman's Food Market, Perkins Oil and Heartland Oil experienced Rotella Performance first hand as special guests throughout the weekend. This truck and tractor pull is held every July and has been named "Pull of the Year" 8 times since 1988 by the National Tractor Pullers Association. This NTPA sanctioned Invitational event draws all the top names in the Diesel Super Stock Tractors, Pro Stock Tractors, 4-Wheel Drive Trucks, Unlimited (multi-engine) Tractors, and the Mini-Rod Classes. The excitement never stops as these horsepower monsters roar down the track, chasing their share of over $100,000.00 in prize money, and bragging right for a year as the "Chapel Hill Champ." O'Reilly Auto Parts had over 60 guests come out to enjoy hospitality at the Chapel Hill tractor pulls. Bowling Green is the ultimate tractor pulling event, and a fitting finish to the Rotella Cup. The event generally draws a lot of outside interest from local media and fans. At one of Koester Racing's appearances at Walmart, WKKO radio station came out to cover the event and capture an interview with Larry Koester. Larry shares his unique story about he become an NTPA champion puller. The Koesters have raised hundreds of thousands of dollars to grant wishes. Adam gives a look into what you an expect at the biggest pull of the year. Larry discusses what Shell Rotella means to his team on and off the track. The Koesters not only use Rotella in their performance tractors, but also in farming. O'Reilly Auto Parts had over 80 guests come out to enjoy hospitality at NTPA Championships in Bowling Green, OH. Larry Koester meets with fans near the O'Reilly Auto Parts hospitality tent. Congratulations to all of the winners on a fantastic competition throughout the year! Along with hospitality at each Rotella Cup event, O'Reilly Auto Parts activates their presenting sponsorship by awarding the Hardest Working Puller. The two pullers with the highest averaging finish from each Rotella Cup division receive gift cards from O'Reilly Auto Parts ($100 for first place and $50 to 2nd place). Bowling Green, OH feels a massive boost to the economy each time the 4th round of the Rotella Cup comes around. WTOL News 11 covered the story and shared it across a variety of channels including Facebook and broadcast TV. "Just wanted to drop a line to say thanks for all you did last night from host, speak, and prepare, to even step in as part of the crew. The knowledge you have and respect you've earned of those families is unbelievable. To take a perfect stranger and throw him in your shadow for a show like that was unreal. It's a memory I won't soon forget and probably rekindled an old fire from deep. 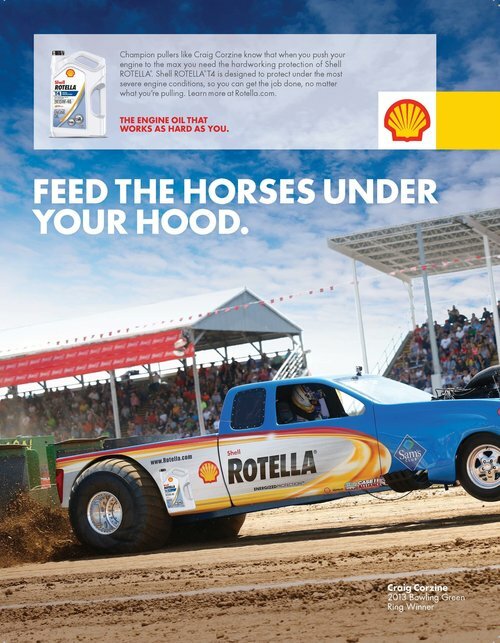 You do a first class job and are a true benefit to the Rotella and Shell brand. Every detail was truly top of the line and I appreciate that for my clients. I look forward to seeing you at another event soon. Thanks for [all you do] to make it happen." We specialize in the business side of motorsports sponsorship portfolios. With a focus on activation and brand building, we get energized from connecting the excitement of sport to the growth of your brand. We combine experience, expertise, and industry passion to bring ideas to life. To learn more about other programs we can help your organization with, leave us your email and we will set up some time to discuss what opportunities are available.